This week is Mental Illness Awareness Week and I came across this quote today which made me feel compelled to write. It reminds me that even though my world feels dark, scary and lonely when my depression comes on, that does not mean there is not something beautiful and light still present in my heart. When my mind tells me I should be in fear and it would be best to just give up, I have to believe that my heart would tell me a different story. My heart would tell me that I am not hopeless and I am worthy. It would say to keep fighting even though it’s difficult, because it’s certainly worth it. On the days that my heart speaks louder than my mind I am at peace. The sun shines a little brighter and getting out of bed is so much easier. I know this lightness in my soul is temporary but it’s absolutely beautiful and I never want it to go away. When my mind is in charge I can’t help but think I would be better off as an angel. Angels can float around their loved ones and protect them and love them from afar but they don’t feel the deep searing pains of depression. They are light and free without worrying that they will soon be taken back to a deep dark place. The world needs to see that some of the most beautiful hearts grow from darkness. Ignoring mental health issues and making heartless judgements about it while people are silently suffering needs to stop. It pains me to see the lack of love and compassion there is regarding this disease where people are voluntarily taking their lives which in turn affects the lives of so many people around them. When a person is diagnosed with cancer, no matter what age they are, there are state of the art facilities available to help them fight the disease. The love, care and concern others show by rallying around their loved one is incredible and the goal is to never allow the person who is walking through this scary experience feel alone. It’s a beautiful thing. Please tell me why it’s so different with mental illness? The lack of services, support, compassion and attention to this issue is devastating. Pain is universal. Pain is real. Darkness is not a choice. Please choose love. 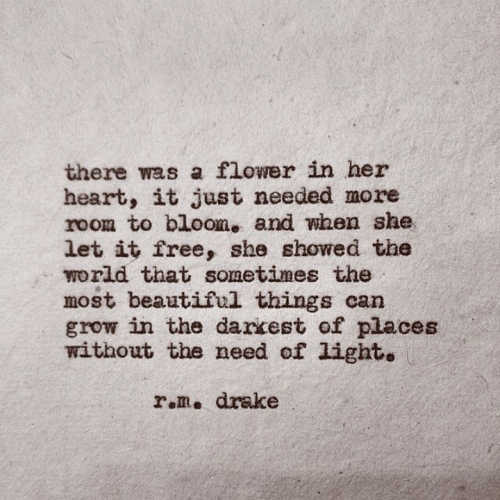 Please let those who suffer see that sometimes the most beautiful things can grow in the dark. This entry was posted in depression, stigma and tagged broken, choose love, dark, darkness, dealing with depression, depression, find the light, hope, light, love, stigma. Bookmark the permalink.